Fryerning is one of those fat, pretty little villages you find so often in Essex, made to seem more remote than it is by local authority planning. 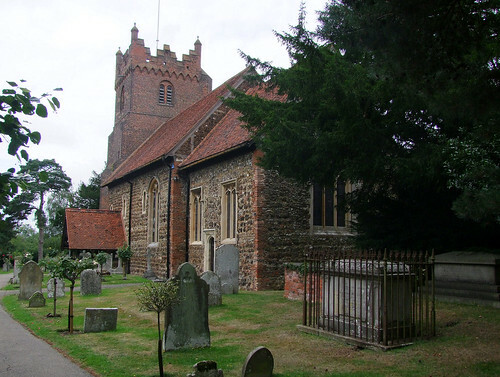 In fact, it is really a suburb of the town of Ingatestone, only a few fields separating them, and their medieval churches a short walk apart. I had been here a few weeks previously, but on that occasion I had found that all five of the keyholders on the keyholder notice were out. Keyholder notices are unusual in Essex - churches are either open or locked, and mostly they are open -but I had seen enough from the outside to make me want to come back. This is another fine red brick church, quite small, but it has lots of excellent modern glass, mostly dating from the 1980s and 1990s. The best is the outstanding Airey Neave memorial window by his niece Penelope. Neave was a lawyer ans Conservative politician with an extraordinary war record. Among other things, he had escaped from Colditz (the castle is depicted in the window), headed the MI9 secret service and read the indictment to the Nazi leaders at the Nuremburg Trials. A hard-line right winger, he played queenmaker to Margaret Thatcher, ensuring that she was elected leader of the Conservative Party in 1975. Neave was assassinated by a car bomb in the Houses of Parliament car park in 1979, apparently by the Irish National Liberation Army, although in recent years there has been increasing speculation that there was British Secret Service involvement in his killing. The window depicts St Michael and St Christopher, as well as Colditz and the Houses of Parliament, and was by made by his cousin, Penelope Neave. As well as other good modern glass, there is a super 13th Century foliage font, most un-East Anglian. All in all I liked it, but the church itself is perhaps no greater than the sum of its parts.